An announcement on the Ministry of Culture’s website says that the Central Partnership film distribution company (which is part of Gazprom Media) has withdrawn its request for distribution certification for the film Child 44, "assuming all commercial responsibilities for the decision." Central Partnership had already signed a distribution package deal with the production company. "The opinion of the distributors and the representatives of the ministry converged: The distribution of such a film on the eve of the 70th anniversary of Victory Day is unacceptable," says the announcement, made following the film's press screening, which took place on April 14 with the participation of the representatives of the Ministry of Culture and Central Partnership. 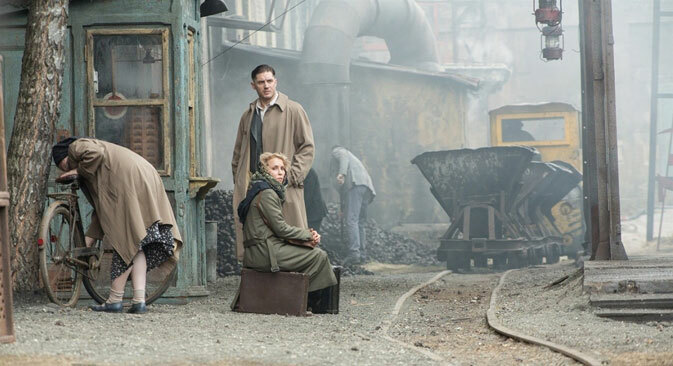 Child 44 is based on Tom Rob Smith's novel of the same name, and is set in 1953. In the plot the protagonist Lev Demidov (played by Tom Hardy) is a disgraced investigator with the Soviet Ministry of State Security who is tasked with investigating a series of child murders in the provinces. The course of the investigation is hampered by the totalitarian system: The organs of state security refuse to admit the existence of the child murderer, demand that the protagonist renounce his wife and in the end remove him from the assignment. The book Child 44 narrates the biography of Soviet serial killer Andrei Chikatilo. However, the author says that "one of the main characters of the novel is Soviet Russia – a monstrous mix of horror and absurdity." "We introduced a series of modifications to the screenplay, production and dubbing," says Pavel Stepanov, director of Central Partnership. But the result, according to Stepanov, did not satisfy the company. "We believe that in the future it will be important for the government to strengthen its control on the distribution of films that have a socially relevant context," added Stepanov. According to the top manager of a production company, the marketing costs of such a movie can range from $100,000 to $500,000. For now there have not been any commercials for the film on television. The RBC source says that a miscalculation was made during the conclusion of the package agreement. In his view the Russian side should have looked at the screenplay and, realizing that the film might be perceived as anti-Soviet or anti-Russian, should have tried to exclude it from the package. Now Central Partnership will most likely have to come to an agreement with the production company, saying that the revenues that the American side was expecting from the release of this film will be compensated by distributing the company's next film, says the RBC source. Child 44, produced by the Canadian-American studio Lionsgate Films, was supposed to appear in Russian movie theaters on Thursday, April 16. The world premiere was scheduled for April 17. In Russia the film was going to be shown on more than 500 screens, according to a Central Partnership representative. The film, whose budget was $50 million, was made by director Daniel Espinosa. Besides Tom Hardy, it also stars Gary Oldman and Vincent Cassel. In the history of Russia's film market this is the first case in which a distributor withdraws his request to receive distributing certification, says Alexander Rodnyansky, producer and co-owner of A Company film distribution (which distributes foreign films in Russia). "This is very unprofessional: obtain the rights to the film, wait until the premiere, withdraw the request and lose the money," he says. According to Rodnyansky, this is a bad sign for the entire Russian film market. "Before, there were films distributed in Russia that did not always portray Soviet or Russian heroes in a positive light, but nothing like this has ever happened," he continues. "Now, obviously, everything that concerns history must correspond to a certain system of coordinates. Then there will be self-censorship: Many will fear buying and distributing (historical) films here."